Food production has come a long way from its unregulated early days, with an ever-growing requirement to keep consumers safe. Regulations constantly evolve and new ones appear that must be complied to, ensuring food is safe for consumption and that the food manufacturer is certified to the required local and international standards. 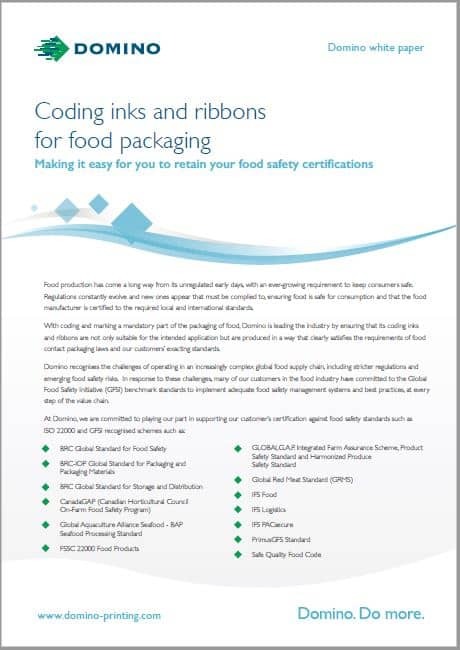 With coding and marking a mandatory part of the packaging of food, Domino is leading the industry by ensuring that its coding inks and ribbons are not only suitable for the intended application but are produced in a way that clearly satisfies the requirements of food contact packaging laws and our customers’ exacting standards. 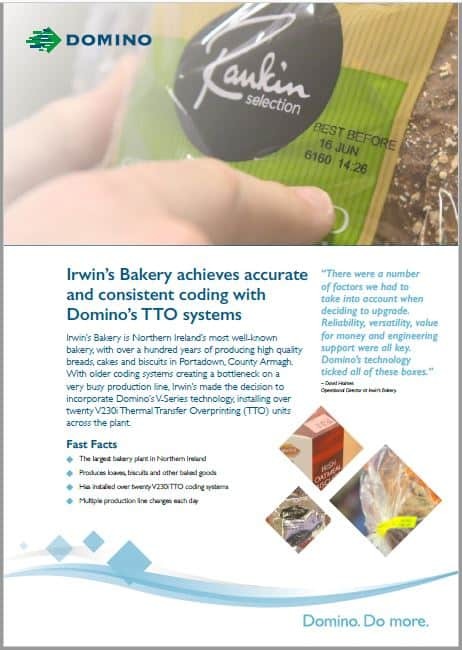 Irwin’s Bakery achieves accurate and consistent coding with Domino’s TTO systems. Irwin’s Bakery is Northern Ireland’s most well-known bakery, with over a hundred years of producing high quality breads, cakes and biscuits in Portadown, County Armagh. With older coding systems creating a bottleneck on a very busy production line, Irwin’s made the decision to incorporate Domino’s V-Series technology, installing over twenty V230i Thermal Transfer Overprinting (TTO) units across the plant. 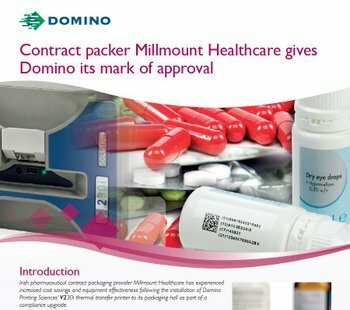 Irish pharmaceutical contract packaging provider Millmount Healthcare has experienced increased cost savings and equipment effectiveness following the installation of Domino Printing Sciences’ V230i thermal transfer printer to its packaging hall as part of a compliance upgrade. In the almost 40 years since counterfeiting of pharmaceutical products was recognised as a problem by the World Health Organization (WHO), the industry has waged a constant battle against increasingly sophisticated and organised counterfeiters, with drug packaging serving as one of its foremost defenses. Food allergens have the potential to be lethal or, at the very least, cause considerable suffering or discomfort to allergy sufferers. The European Academy of Allergy and Clinical Immunology (EAACI) estimates 17 million allergy sufferers throughout Europe. 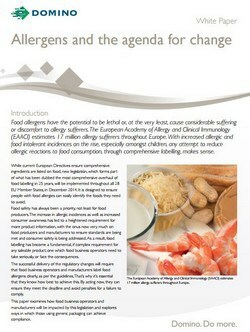 With increased allergic and food intolerant incidences on the rise, especially amongst children, any attempt to reduce allergic reactions to food consumption, through comprehensive labelling, makes sense. Unique Device Identification (UDI) has been recognised as a key tool in improving patient outcomes. More efficient recall procedures, reduced medical errors, increased inventory visibility and supply chain security are all enabled through UDI. 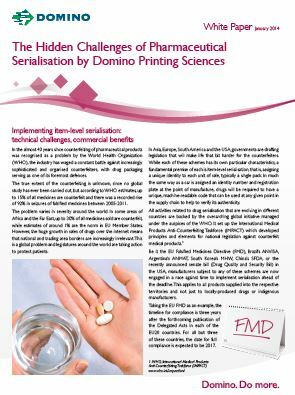 Under the FDA rule, if manufacturers have not implemented UDI on a number of product categories by September 2014 they may no longer be able to supply product into the USA, with other markets expected to follow shortly with similar legislation. 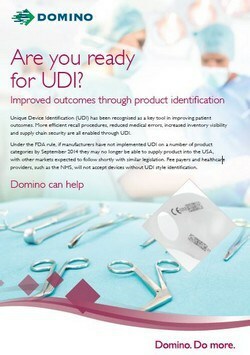 Fee payers and healthcare providers, such as the NHS, will not accept devices without UDI style identification. 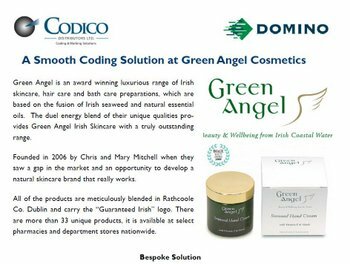 Green Angel is an award winning luxurious range of Irish skincare, hair care and bath care preparations, which are based on the fusion of Irish seaweed and natural essential oils. The duel energy blend of their unique qualities pro-vides Green Angel Irish Skincare with a truly outstanding range.